Gizmodo has some nice pictures and some more information on the Vudu Video-On-Demand box. 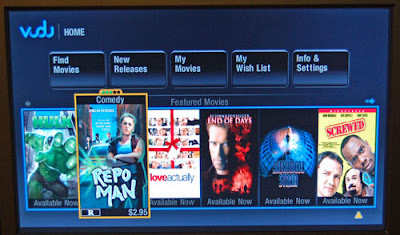 You purchase the box which they say will be under $500, hook it up to your TV, then browse the movies you want to watch. You can either rent the movie at 99 cents to $3.99 or purchase the movie. I think this is a really cool idea but the initial purchase price better be no where close to $500. For something like this you would need to rent movies cheaper than NetFlix or give rewards for multiple rentals. It will be interesting later this summer when it’s suppose to be released.